The number of Porsche apps available for iTunes, Android and other mobile devices is definitely growing. However, in our opinion, the majority of them are crap. There are, however, exceptions and "50 Years of Porsche" from Autoweek is one of them. Available for free download on iTunes, Android and Amazon/Kindle, the app offers more than 80 pages of past Porsche articles from the Autoweek's rich and diverse archives. 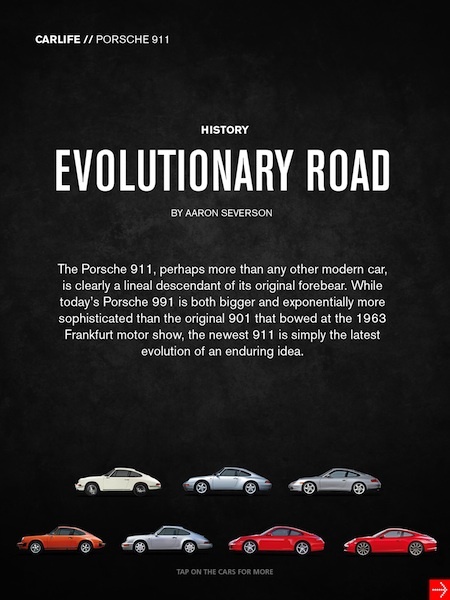 We started our journey with their first story on the '95 Carrera 4 and read through to a section titled "Evolutionary Road". Here, tapping on each generation of 911 gives you a brief history of the model and some of the more substantial changes for that variant. There's Boxster content, Cayman content, Motorsport content, you name it, there's a story you'll find interesting. It's basically 20 years of Autoweek Porsche goodness at your fingertips. Even better, a number of the stories have interactive capabilities where you can simply touch a button and watch a video or get additional information about the story and Porsche you're reading about. At this point we're only about half way through the app and our brain is already on overload. If you download any one Porsche app this year, this is the one. You can use any of the links we provided at the top of this post, or jump on over to Autoweek and go from there. Enjoy!